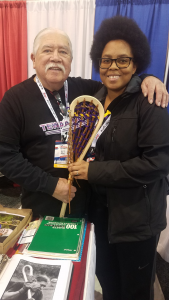 On Saturday, January 12, 2019, Athletic Director and Health/PE Teacher, Miss Davenport, spoke at the US Lacrosse 2019 LaxCon National Convention in Philadelphia, PA. Her presentation, “The Buy In–A Coaching Philosophy,” Miss Davenport guided those in attendance in understanding the importance of having a coaching philosophy, the creation of her own coaching philosophy, and used a workshop-style of presenting to guide others in creating their own coaching philosophy. “A coaching philosophy is a way for players and families to understand where you stand as a coach and how they will be held accountable to the standards of the program,” Davenport shared. Miss Davenport’s coaching philosophy of “You’re a person first, a student second, and an athlete third” is at the foundations of CRDLS Athletics. Her goal is for all athletes and families to understand that without taking care of the person (health, needs being met, sportsmanship, etc), other aspects will falter. With academics next, it reinforces the foundation that we have student athletes who have expectations in the classroom. Finally, as an athlete, there’s a cultural aspect to being a teammate as well as an accountability for time management and communication.